The State Street Investor Confidence Index, is a little known sentiment indicator which I mentioned briefly two years ago(see link). State Street (STT) calculates this every month and even though by now you’ve probably become numb to the idea of yet another sentiment gauge hitting an all time extreme, the most recent data for December 2008 was the lowest since this measure was started - coming in at just 48. The State Street Investor Confidence Index measures confidence directly and quantitatively by assessing the changes in investor holdings of equities, implementing a model developed by State Street Global Markets’ research partnership, State Street Associates. The more of their portfolio that institutional investors are willing to devote to equities, the greater their risk appetite or confidence. dip their quantitative thimble into the massive flow of funds that passes through their firm to measure the sentiment prevailing among money managers. It isn’t surprising considering everything else we know, that managers are reigning in their risk appetite to a larger extent than they have for the past 10 years. The good news is that from a contrarian measure, such a low sentiment reading is either the darkest before the dawn or very close to it. The bad news is that a bull market needs fresh capital to start and to continue but so far, money managers are still reducing exposure to equities. State Street also releases the same sentiment data regional data. The 48 number is an aggregate global figure. For North America it is even lower, 30.1 - for Asia it is the highest at 86.1 (and Europe comes in somewhere in the middle at 67.4). Ten years is not enough to provide us with enough data points to evaluate the efficacy of the State Street Investor Confidence Index. But it does to show some promise. Definitely more than the useless Citigroup Panic Euphoria Model. 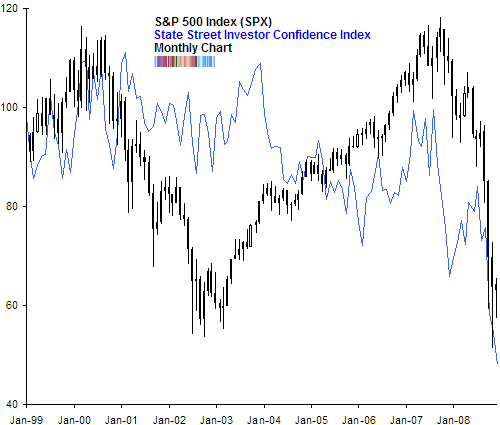 You can find more information about the State Street Investor Confidence Index at their website. Well i can tell you sentiment around our office isn’t fantastic. I think sentiment indicators are funny, do you really need a special “quantitative” model to let you times are tought right now and many ppl have recently lost money on the stock market? Its should be renamed “stating the obvious” indicator. Looks like a leading indicator. However like you said not enough data to be convinced —-. Looks like the professionals are as scared as the regular joe.